The worst thing is having to cut your Christmas day short because someone has food poisoning. Knowing how to properly cook and store food this Christmas could save you a lengthy trip to A&E. Also consider how you are preparing food for parties and how long you should keep the left overs after. Only store left overs including cooked meat, egg and prepared salads for 3-4 days in the fridge. If you are unsure how long something has been there or you aren’t sure if it is still ok to eat throw it away. Also never eat anything past its use by date. If it is a best before use your own judgement but it is best not to risk eating food past it’s use by date. Thoroughly thaw meat and poultry in the refrigerator or microwave before cooking. Not at room temperature. Cooked poultry needs to be at least 75 degrees C inside when cooked. 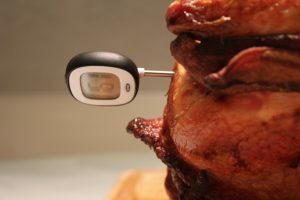 Use a meat thermometer to confirm the temperature before consuming. Follow the same process for any other meat. Just because it is hot on the outside doesn’t mean it is thoroughly cooked on the inside and that can cause food poisoning. Wash your hands with soap and warm, running water for at least 15 seconds before preparing food, especially after handling raw meat, poultry, fish or eggs. Do not wash raw meat. Splashing can spread campylobacter on to surfaces, clothing and equipment which can lead to serious illness. Thorough cooking kills harmful bacteria. Keep all cooking and preparation areas clean and don’t reuse utensils as they may be harbouring germs. Separate raw meats and veg when preparing them so that they don’t become contaminated. Wash all fruit and veg before cooking or serving. If you are interested in learning more about food safety, hygiene, preparation and storage why not consider taking one of our Level 2 Food Safety courses!